¶ 4 Leave a comment on paragraph 4 0 This record of Lazarus Goggenheimb, alias Siessel or Süssel, had remained the earliest trace of my maternal grand­mother’s a­nces­tors for many years. Sies­sel became the pro­ge­ni­tor of a huge clan with des­cendants in Eu­rope, the Ame­ricas, Aus­tralia, and the Middle East. But a question kept nag­ging me: Why would a young man in the early eighteenth cen­tury seek a wife some two hun­dred ki­lo­metres from home? ¶ 5 Leave a comment on paragraph 5 0 I was unable to find an au­tho­ri­tative work on the history of the Jews in Stühlingen, a German town at the foot of the Black Forest, bordering Switzerland. They had vanished after 1743. Although the Jews of Stühlingen form part of the foundation myths of the old Jewish communities in Gailingen, Tiengen, Endingen, and Lengnau – the root stock of Swiss Jewry – no bard has sung their dirge; no scholar has unearthed their secrets. The life and demise of the Stühlingen Jews from 1600 to 1743 seem to have transpired largely in a blind spot of history. The historical literature covering these circumstances and events is amazingly scant, both from an internal, Jewish and an external, gentile perspective. This gaping void begged to be filled. To learn more, I had to research it myself. But living in Canada, far from Stühlingen itself and the relevant archives, posed one difficulty, and not being a professional historian another. ¶ 6 Leave a comment on paragraph 6 0 To approach the problem, I oriented myself on the method Shlomo Ettlinger had employed in his “Ele Toldot” inventory of the inhabitants of the Frankfurt ghetto in the sixteenth and seventeenth centuries.2 Though the scope of my problem was infinitesimally smaller than Ettlinger’s, I would be using potent tools powered by technology and passion, and the most precious, but frequently squandered, resource: time – time unencumbered by meetings, deadlines, or other people’s priorities. ¶ 7 Leave a comment on paragraph 7 0 A pilot study based on limited existing primary data, together with some newer transcriptions of eighteenth century county and municipal accounting books, enabled me to develop a technique for systematically exploiting the patterns found in time, names, and locations to construct a pixelated model of the historical community. This early work was implemented on a giant spreadsheet. ¶ 8 Leave a comment on paragraph 8 0 I then found a researcher in southern Germany who was willing to travel to the county archives in Donaueschingen and to their provincial equivalent in Karlsruhe on a contractual basis, both for me and later on also for another interested party. 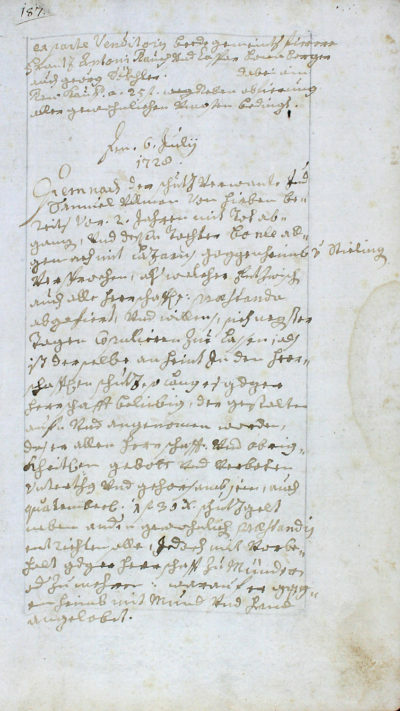 Our researcher extracted dated abstracts of each entry concerning Stühlingen Jews in municipal, judiciary, and county records between 1600 and 1745. But as more and more archival transcripts started to arrive, the spreadsheet technique turned progressively impractical. It became necessary to write extensive analysis software based on a relational database. The original narrative listings were fragmented, filtered, transformed, sorted, interpreted, and reassembled. ¶ 9 Leave a comment on paragraph 9 0 Gradually a picture started to emerge from the mist, a picture of real people with their fortes and foibles, their occupations and relationships. Little by little, individuals coalesced into an evolving community. The Jews of Stühlingen multiplied, spread, and were finally expelled. From some 300 typed pages systematically listing abstracts drawn from 205 individual sources of dry, administrative prose, broken down into 4826 primary, dated records that refer to 190 distinct individuals who are named a total of 7538 times, it became possible to reconstruct the likeness of a long-forgotten community – a likeness no less fascinating than that of a delicate vase lovingly restored by an archaeologist, shard by shard from a pile of rubble. 1StAA. VÖ 263 fol.187. Author’s translation.